Autosubscribe customers to newsletter on registration and place order, collect not subscribed emails from orders and subscribe it! 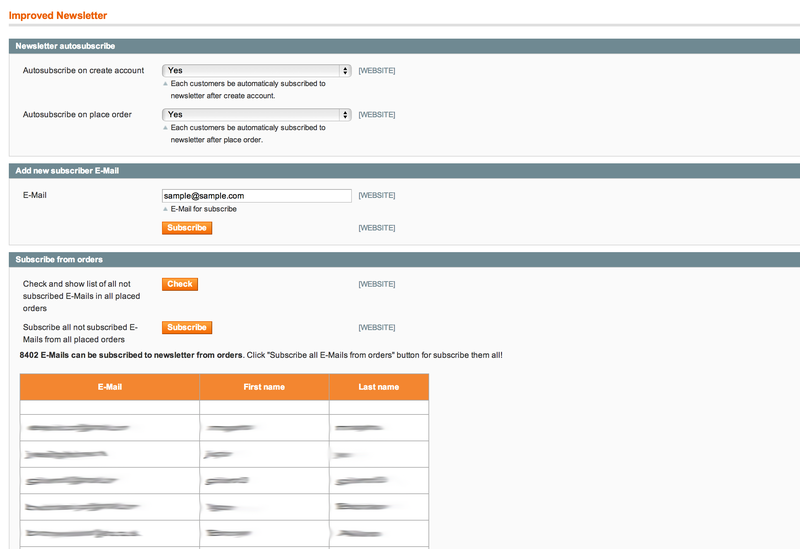 Fast manual newsletter subscription by E-Mail in Magento admin. 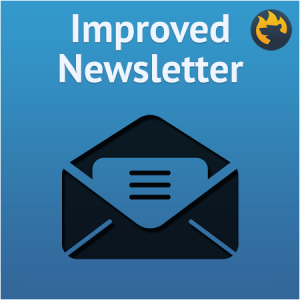 With Improved Newsletter you really can increase you E-Mail marketing profit! Email marketing is such kind of marketing when you send commercial messages to the customers by email. So every email sent to a current or future customer could be a part of email marketing campaign. Ads, solicit sales, donations or business requests are the main subjects of email marketing. The main goals of every campaign are trust, loyalty, brand awareness and, of course, new customers. Email marketing can be done to either current customer database or sold lists. In comparison to traditional mail advertising email marketing is much faster, cheaper, has almost the same amount of potential customers with higher response rate and, last but not least, higher average order value for e-commerce businesses. Right newsletter can capture new leads, turn visitor into buyer, gain customers loyalty, and make a real revolution on your Magento webstore. It is very powerful tool and correct extension plays one of the major roles in the whole process. MailChimp is a provider of email marketing services. The company was founded in 2001 as a paid service, but now it also has a freemium option. Now MailChimp has 3.5 million users that collectively send over 4 billion emails a month using the service, which exists as a web-based application (for different features it can be used offline). With subscriber profiles you can learn a lot about your customers: just click someone’s name and you will see engagement, website activity and many more. By using segmentation and targeting options you can send right emails to right customers: the massages are based on users website activities. Use advanced reporting options to get more information about sales, website activity and revenue. Build your own email using email template reference. With MailChimp, all your subscribers will get fast and easy connect to their social networking pages and opportunity to share your email marketing campaigns with their friends. In your turn you will be able to use social networking for more successful email marketing campaigns. You will need just one click to start an email campaign or update your social networks with latest information. Get full integration with MailChimp with MageMonkey. By installing this extension you can send transactional emails through Mandrill (the service is free if you send not more than 12K emails/month). The other important feature is ability to send Autoresponders emails. That are usually dedicated to birthdays, related products, different review. Also you will get support for Abandoned Carts Recovery by Mandrill and integration of ECommerce360. Different MailChimp email lists and multiple interest groups are also supported by MageMonkey. Another strong point of the extension is support for WebHooks, which keeps synchronisation between Magento and MailChimp. Also it has double opt-in support. It is very strong eCommerce analytics tool for providing successful email marketing campaigns. By using this extension you’ll have the ability to send highly targeted emails to right customers segments, which are based on their behavior and purchase history. You will also get all the necessary data for triggered and automated retention marketing campaigns in MailChimp. Always send the Right Emails to the Right Customers solely at the Right Time only! Connect, analyse and automate – install MailChimp / eCommerce 360 Integration and it will do everything instead of you. Increase revenues from Email Marketing, use instant access to useful data from MailChimp, get your customers divided into groups and many many more with MailChimp / eCommerce 360 extension.